The mulberry (Morus australis or Morus nigra) is a genus of flowering plants in the family Moraceae. The tree is usually cultivated in many temperate regions throughout the world. The sweet fruit changes color from white or green through to pink or red, and eventually stay at dark purple or even black. The mulberry (Morus australis or Morus nigra) is a genus of flowering plants in the family Moraceae. The tree is usually cultivated in many temperate regions throughout the world. The sweet fruit changes color from white or green through to pink or red, and eventually stay at dark purple or even black. People take advantage of the sweet or tart flavor in culinary arts by making it the basis in certain foods like jams, jellies, fruit tarts, pies, wines, teas, and cordials. Here are the 7 health benefits of mulberries. 1. Mulberries are a great source of fiber. Mulberries are a significant source of dietary fiber. Dietary fiber with water can help constipation, making one’s bowel movement easier to manage. Additionally, fiber contributes to regulating cholesterol levels and can boost heart health when regularly added to the diet.The daily recommended dietary fiber intake for men and women are 38 grams and 25 grams, respectively. 2. 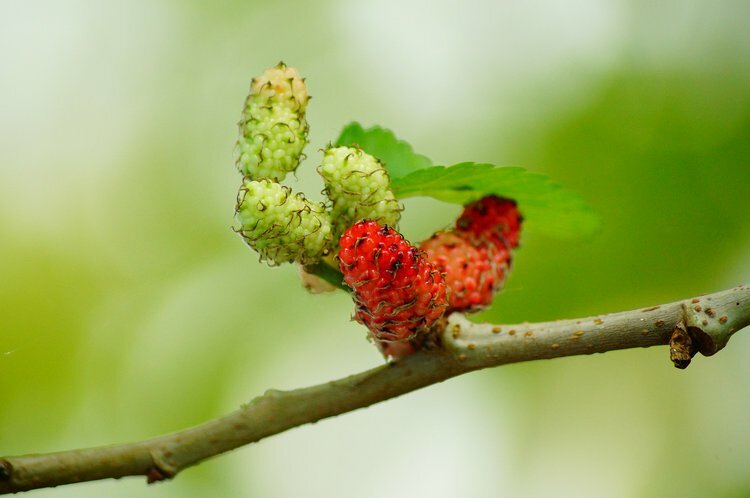 Mulberries can help individuals battle infections. A cup of mulberries has 85 percent of the vitamin C daily requirements. Vitamin C is a potent natural water-soluble antioxidant that helps the body develop resistance against infectious agents and eliminates cancer-causing free radicals in the body. 3. Mulberries can help increase bone strength. Mulberries are a good source of vitamin K, which functions in retaining calcium in the bone matrix. Sufficient vitamin K consumption may also reduce urinary excretion of calcium. One cup of mulberries contains 14 percent of the daily recommended value of vitamin K.
4. Mulberries contain anti-inflammatory benefits. Vitamin K acts as a direct regulator of our inflammatory response. 5. Mulberries can help maintain a healthy blood pressure. Mulberries have a very high content of potassium and a low content of sodium. One cup of mustard greens contains 272 milligrams of potassium, compared to 14.0 milligrams of sodium. Folate also contributes to the reduction of hypertension and relaxes blood vessels, while maintaining proper blood flow. Mulberries also contain an important flavonoid antioxidant resveratrol. This compound directly affects the functioning of certain mechanisms in blood vessels, primarily making them less likely to damage by angiotensin, which can cause blood vessel constriction. Resveratrol increased the production of nitric oxide, which relaxes the blood vessels. 6. Mulberries can assist in red blood cell formation. Copper and iron are essential for the new blood cell formation. Higher levels of iron in mulberries can significantly enhance the body’s production of red blood cells. A deficiency of iron can lead to anemia and fatigue. 7. Mulberries have a high antioxidant content. Mulberries are a good source of vitamins A, vitamin E, and carotenoid components like lutein, beta-carotene, zeaxanthin, and alpha carotene. These antioxidants help reduce blemishes and age spots, keeping the body from aging prematurely. Vahlquist, A., Lee, J. B., Michaëlsson, G., & Rollman, O. (1982). Vitamin A in human skin: II Concentrations of carotene, retinol and dehydroretinol in various components of normal skin. Journal of Investigative Dermatology, 79(2), 94-97. Gülçin, İ. (2010). Antioxidant properties of resveratrol: a structure–activity insight. Innovative Food Science & Emerging Technologies, 11(1), 210-218.